Would be great to see some video of the Chinese students partying … not sure people here [England] know that Chinese people have fun in quite the same way as here! Don’t they just stay at home and do maths homework? Obviously, it’s not all about the math. I’ll admit the image I’ve been presenting on this blog of the young Chinese of my generation is more homework, less partying. There’s a whole other face of China’s ‘new new youth’ out there: in clubs like D22, enjoying more freedoms than any Chinese generation before them. Just last night, I met at a party a group of 20-something Chinese hip-hop DJs and dancers (“the hip hop scene is only just beginning in China, rock has been around for longer”) – one of whom said he carried around his neck at all times a å‰‘çŽ‰ or ‘kendama‘, a gaming craze I’ll be keeping my eye on. This said, the young China I’m in and around – the campuses of Peking and Tsinghua Universities – isn’t that young China. 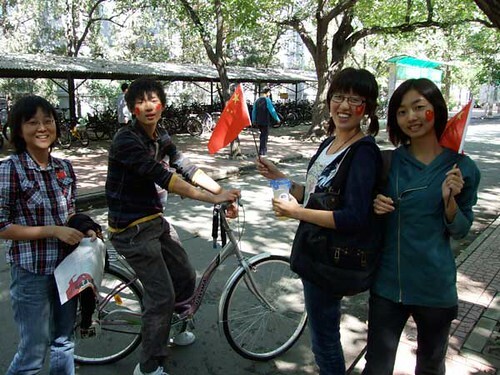 When I asked my friends on campus what they did for fun, or to relax on a Friday night, the same responses did a loop-the-loop: go out for a meal with friends; stay in the dormitory with friends; stay in the dormitory watching Youku; weekend trips to grasslands or other sights in China, a cheap train ticket away. Not discos. Not drugs. Drinking, but not drinking. So what about Ben? He’s not a student, he’s a working guy who came to Beijing from the countryside to strike it lucky. Now his online clothes shop – one of the thousands (more?) 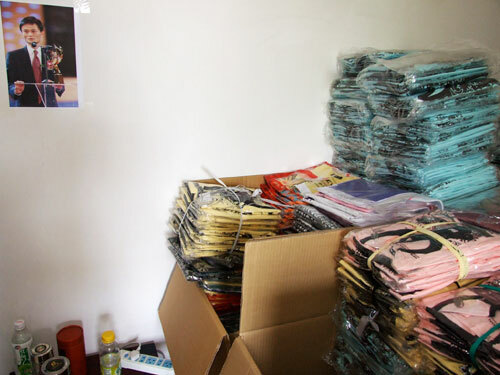 on the Chinese eBay, Taobao – has two employees and recently got ranked in a top hundred list on Taobao. Ben himself is working so hard he’s only getting 5 to 6 hours sleep at night (“I work until midnight”). How’s that for a definition of ‘miscellania’? Or indeed, ‘anything for a buck or two’. None of the above business, Ben assures me, was against the rules of his college – it’s all legit (i.e. he wasn’t hawking event tickets, he was selling them for the organisers). And no, I’ve no idea where the hell he gets his seashells from in landlocked Shanxi. The other day, over too much food, Ben was telling me about two friends from his hometown who just got married. (I find Chinese invariably over-order when treating, for fear of appearing stingy, but Ben wins the grand prize. I put it down to some knee-jerk instinct which Chinese businessman-to-be seem to develop at the age of four. )Â As yet another egg dish appeared in front of me – despite my having protested I’d already eaten a bowl of noodles that night – I was curious to hear more. Both of these friends come from poor families, like Ben’s, and have also moved away to try their luck in bigger cities. But how Ben related their different fortunes is telling. The first (I didn’t catch any names, unless Ben mentioned them while my face was drowning in egg soup) is an old story: college sweethearts wait five or six years before marrying, moving to the nearest big city near their littler hometown, and begin the struggle of earning their new rent with sales jobs. Ben went to see their wedding and came back full of smiles but with no comments besides: they would have married earlier if they had more money, and maybe now it is still too early. Ben didn’t witness the wedding of his second friend (too busy with the winter rush), but had more to say about it. This guy works as a TV host for local news (“he is very handsome”, Ben interjects in careful English, as is his habit) and does pretty OK for it. What’s more, he married into money: his bride inherited her parents’ business. “I have seen pictures of their apartment”, Ben offers, and launches into a considered inventory of its square-footage and cost (500,000 kuai for the flat, another half million to furnish and decorate). I got though a whole plate of egg and tomato before he wrapped it by lowering his voice and confiding: “actually, most is paid by his wife”. 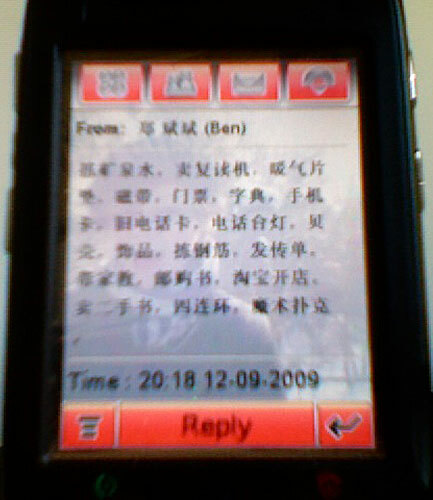 Given that Ben’s description of his friend’s marriage was so speedily hijacked by analysis of their financial situation, I showed Ben my homework (so many grammar mistakes) and asked what he thought: should the white haired girl marry the rich landlord? He shrugged it off with a laugh. “Of course not.” But, he added, maybe she can’t marry her impoverished true love either unless he has earnt some more first. I thought that was quite a telling response. Happy Mooncake day allÂ … how fast these festivals come and go. The PRC’s 60th birthday was only two days ago and already the nation has movedÂ ontoÂ the excessive gifting of odd-tasting pastry.Â There’s probably a relevant Chinese saying which I could quote here – but I won’t. On national day, I took a morning busÂ Â (on gloriously empty streets) to Peking University or ‘Beida’ to watch the televisedÂ celebrations with students. If you’re after the parade itself, have a look at this wonderful 4 minute time-lapse and slow-mo version by Dan Chung of the Guardian. As a Brit I have a inborn loathing of jingoism, which was rife in the parade itself. Patriotism is OK, however, and it was this that the Beida students were displaying – more than I had ever seen them show, including in the aftermath of a successful Olympics (the ping pong was all in Beida’s gym). Below I’ll split up what I witnessed into a few liberally captioned photos. First, I asked each of the six characters I follow on this blog what they were doing and how they felt on this big day (as we know, any numberÂ like ‘6’ or 60′ is auspicious in China, so this national dayÂ was particulary special). Tony … was watching the parade with me. He’d been one of the school kids in the 1999 fifty year anniversary parade, and seemed a little cynical of the eerily similar pomp and circumstance this time around. As ever he took pleasure in pointing out the politically significant bits, like howÂ outsideÂ the limelightÂ Xi Jinping was in the whole affair – a potential sign of his guessed-at leadership of China from 2012 being postponed, possibly forever. Leonidas … got into Beida’s auditorium for the showing there (more below). When I then met up with him for noodles, he was clutching a Chinese flag and said he was almost moved to tears by the parade. This from a guy who’s head, in my experience, generally tends to be off in the clouds of classical Chinese literature more than it is on the ground of contemporary China. Marie … was watching the internet stream in her dorm with her flatmates – one of whom was still sleeping from all the homework she was up late last night doing, even in this week-long national holiday. Earlier, I’d read a corny line in a Chinese paper: “today is your birthday too”. I’d sent Marie a text jokingly asking if this was true. I felt bad at my whimsy when she seriously replied “yes, today is also like my birthday”. William … reinforced the message: “today is new China’s birthday”. New China (xin zhongguo)Â is a term much bandied about, claimed by the May Fourth movement as well as Sun Yatsen or the CCP (potentially by the reform and opening up era too). Normally, I’m never quite sure ‘new China’ is whose. 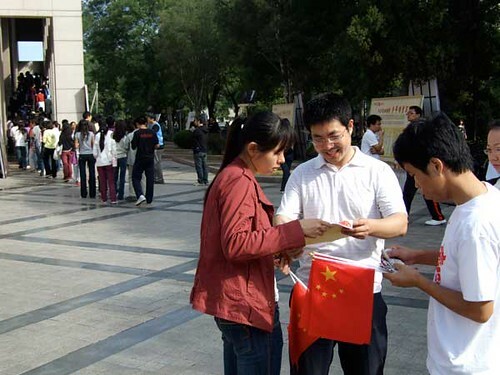 Today, for young Chinese, new China was all Hu’s. Ben … was sleeping in, but with the TV on in the background. This guy far-right had sold forty or so flags by 9aï½. 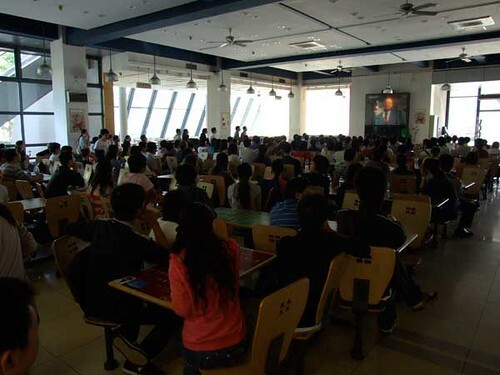 Behind them, Beida students line up for the screening of the parade on the big cinema screen in campus. They’d got their free tickets three days ago by queuing for (hear-say alert!) nearly 2km. Leonidas told me all of the students at this screening Â stood up to give Hu Jintao an ovation. Tony and I most certainly did not queue for 2km, and so we watched the event in a neighbouring canteen – on a decidedly inferior screen with a fuzzy top-left panel which made Jiang Zemin look like a gremlin. There was a big laugh when Hu smiled upon seeing the troupe of female soldiers in high red skirts goose-step by. I got the impression here that most students were enjoying the fun ofÂ a big parade more thanÂ being overwhelmed with love of their country. And when the canteen started serving food – an hour before the parade was over – everyone was suddenly much more interested in lunch. Zhongguo jiayou! Go China! IfÂ this were England, by the way, this picture could only mean one thing: these students had been watching a football or rugby game, not a military parade. 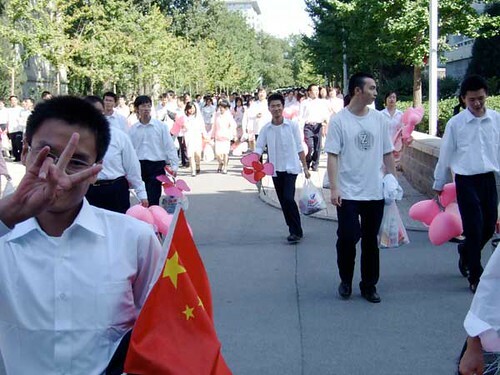 A contingent of Beida students took part in the parade, wafting symbolic pink wind fans (you can see them at 3:10 in the video I link to near the top of this post). Here they are, having been shipped back to their campus by giant buses, still pumped – despite having got out of bed at 2:30am to head down to Tiananmen square, and after a summer of compulsory training sessions two or three times a week.